The front door of your home is one of the hardest-working and highest-wearing features of your house. Your front door needs to be tough enough to withstand the outdoor environment, and tough enough to prevent unwanted visitors. Yet it also needs to match the existing aesthetic of your home and last through tough weather events and general day-to-day usage. Most homeowners consider the visual aspect of the front door before considering the practical features like security and protection. Security doors can keep out unwelcome guests and unwanted elements from the outdoors. Decorative security doors can be the key to combining both style and security when creating the right entrance to your home. The Internet can be full of inspiration for finding the right security door for your home. But instead of considering a door, consider installing a piece of art that will add front yard appeal to your home. There are plenty of considerations to make when securing your home with a decorative security door, but the first is ensuring you choose the right door for your home and lifestyle. The considerations are varied when choosing the right security door for your home. The most obvious consideration is the need for security in your home. Is a security door necessary for the area you live in? The answer can be a resounding yes, as we now live in times where it is much better to be safe than sorry. A home without a security door can make your property attractive to burglars as they see the entrance as an easy access point. Deterring unwanted guests can be as simple as installing a decorative security door that looks difficult to vandalise to gain entry. Another question to think about is what is your security door preference? Many homes opt for grilles or safety mesh which can add a prison-like appearance to your home. Rather than sacrifice the aesthetics of your house for safety, consider a decorative security door which combines the two needs into one. Wrought iron decorative security doors combine style and security, without compromising on aesthetics or safety. Their timeless appeal makes them a popular choice for homes that prefer a security door with personality, rather than a stock-standard screen. The cost of securing your home also needs to be considered. Even if you decide against the installation of a security door, other protective measures can be costly. The price of security cameras and alarms, while extremely beneficial, could be avoided with the right security door. Insurance companies will also want to know how secure your property is – especially at the entrance. When compiling a custom policy for your home, they will ask how secure your front door is. A security door adds peace of mind for not only yourself, but also for the insurance company, knowing you have taken vital measures to prevent a claim and deter possible burglars from entering your property. 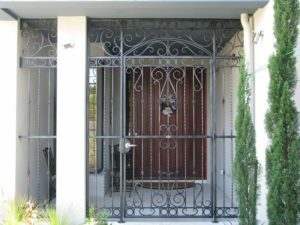 There are many benefits to installing a wrought iron security door to the front of your home. Wrought iron is strong and can’t be easily damaged. It can also be welded into a design that suits your tastes and style of your property. Here is just a general list of positive benefits of using wrought iron, if you’re considering this style of decorative security door for your property. #1 Versatile in design. Wrought iron security doors are stylish and can add value and class to the front of your home. There designs aren’t limited, and they can be quite broad to suit your property. #2 The door design can match the security gate design, to allow for symmetry in design. #3 Iron security doors allow for an easy view outside, without blocking the outlook of the front yard. #4 They also allow for air flow through the house. They make the perfect lock and leave solution if you do small trips during the day. #6 Wrought iron doors are not easily penetrable. They are difficult to damage if a break and enter is attempted on your property. #7The doors can withstand strong winds and dangerous weather. #8 Your door can be custom designed to suit the aesthetics of your home. #9 Windows can also display a similar design to keep a harmonising outdoor appearance. #10 Won’t crack or break. Decorative security doors can contrast well with existing doors. Many home owners opt for a security door and a wooden door, choosing a decorative security door to add interest to their home. The style of decorative security door for your home needs to suit the interior and outerior aspects of your home. A baroque style decorative security door will stick out on a modern home, while a modern grid style door won’t suit a heritage style home. A leaf or vine style design security door looks stunning against a wooden door. The design of the wrought iron contrasts beautifully against the timber grain. A busy design like a baroque or grill design can offset against a darker door, creating a moody entrance. If your property doesn’t have allowance for a security door, consider a gate, offset from the front door. It offers the same security features as a security door. Alternatively, if it suits the aesthetic of your property, a wrought iron door combines both the security screen and door in the one fixture. This is an elegant design that would suit an older, heritage or colonial style home. If you have a particular design and style in mind, discuss your idea with the team at Dean Wilson Iron. Their experience in creating custom decorative security doors, allows them to offer advice on what can be produced. They have experience installing wrought iron gates and doors all over South East Queensland. When it comes to choosing the right decorative security door for your home, talking to a professional installer like Dean Wilson Iron, will help you get the right look, without compromising on security and practicality aspects. Whether your house is modern waterfront mansion or a suburban Queenslander, there is a wrought iron security door perfect for your home. Contact Dean Wilson Iron for a consultation and quote and trust they will be able to help you decide on this important feature for your home.